When is the last time you went car shopping? Let’s say you recently purchased a brand new Ford Mustang. You bought a red one because you couldn’t resist the Candy Apple Red. One day you park your car next to its identical twin: Ford, Mustang, Candy Apple Red. Your eye can’t tell the difference between the two colors of the different vehicles. In fact, every Candy Apple Red Ford Mustang that is the same make and model is identical in color. Precisely matching paint color is not an easy task. Our eyes are exquisitely accurate and can notice the slight difference between 2 similar, but not precisely the same, colors. The human eye can detect small differences in color, shade, hue, and brilliance. Paint for automobiles must be manufactured with incredible consistency to achieve this result. Paints include many different components and the purpose of particular paint mixtures dictate what the ingredients in the paint are. One component that contributes greatly to the final color of paint is pigment. For example, there might be many natural pigments used to make 1 paint color, like talc, silica, calcium carbonate, or clay. Some pigments may be manufactured to enhance their properties. Other pigments provide protection from sunlight or other environmental conditions. Fillers are often added to paint to adjust the thickness and volume of the paint. This allows for different methods to be used during the painting process. Binders are added to paint so the paint adheres to surfaces properly. In general, binders are some type of resin, like polyester, epoxy, oil, acrylic, or polyurethane. Solvents and other additives are also included. All of the ingredients must be mixed in a precise ratio to achieve the desired consistency for the paint. It might seem like the best method for dispensing items would be by volume, but it becomes apparent quickly that this method is virtually impossible. Some of the ingredients in paint are viscous liquids and other ingredients are powders or slurries. This means volume measurements become inaccurate easily. Consequently, weight must be used instead of volume. Some paint ingredients are a small percentage of the overall volume but the ingredients still have inordinate effects on the final product (otherwise, why would the ingredient be a part of the mixture?) This can be the case with pigments especially. Consider your Candy Apple Red Ford Mustang again. The amount of red pigment used in the paint for the vehicles must be measured with extreme precision. Ultra Precision Scales by Arlyn Scales are the best way to do this. Industrial scales used to mix paint must have large enough capacities to weigh giant batches of paint, but the scales must also have extremely high resolution so the pigments and other micro-ingredients in the paint mixtures can be accurately measured. Depending on the volume of a batch of paint, a digital scale used to mix the paint may be a bench scale, drum scale, or platform scale. Most electronic scales are not suitable to measure ingredients for paint mixing. The most common industrial scale technology is Strain Gage. While strain gage load cells are fairly inexpensive, this type of load cell has limited levels of accuracy. A standard bench scale or platform scale with a weight capacity of 100 pounds might have a resolution of .02 pounds. The best industrial units available may increase this resolution to .01 pounds. The total amount of a certain color pigment may be in the range of 1 or 2 pounds, so it is evident that a scale with a resolution or .01 or .02 pounds is not appropriate. A new technology in industrial scales is offered by Arlyn Scales in our line of Ultra Precision Scales: Surface Acoustic Wave (SAW) technology. Our line of Ultra Precision Scales utilizes a semiconductor transducer to provide up to 20 times the resolution of strain gage scales. A 100-pound capacity Ultra Precision Scale provides a resolution of .001 pounds. These scales offer enough accuracy to accurately add each of the ingredients into the paint. These paint scales are available with capacities ranging between 5 and 200 pounds. 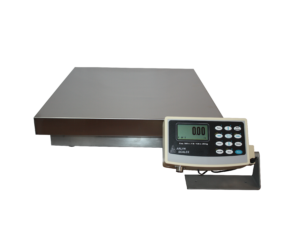 Larger platform scales with SAW technology are available and the weight capacities range between 200 and 500 pounds. An additional feature of the line of SAW scales is high overload specification. While some electronic scales may be damage if a paint bucket is dropped onto the scale platform, Ultra Precision Scales offer a maximum overload of 500% of whatever the capacity of the scale is. Inside every Ultra Precision Scale manufactured by Arlyn Scales, there are 2 Surface Acoustic Wave transducers. The transducers are installed at a set distance apart underneath the scale’s weighing platform. When an object is placed on the platform, the distance between the transducers increases and the new distance is in correlation with the weight of the load on the platform. The transducers in Ultra Precision Scales are the most vital component of the weighing process. One transducer acts as a transmitter, while the other transducer serves as a receiver. When a load is placed on the scale platform, the transmitting transducer sends a wave to the receiving transducer. The receiving transducer takes the wave, amplifies it, and sends it back to the first transducer—and the wave continues to go back and forth between the two transducers. SAW technology measures the time it takes for the initial wave to travel from the transmitting transducer to the receiving transducer and the measurements are recorded digitally. You can learn more about Ultra Precision Scales, Surface Acoustic Wave technology, and all of the scales Arlyn Scales manufactures by visiting our website. Be sure to check out the selection of add-on options and upgrades Arlyn offers for our Ultra Precision Scales. If you have questions and would like to talk to a member of Arlyn Scales’ knowledgeable and friendly staff, then do not hesitate to reach out to us today. Customers can reach Arlyn Scales’ team by calling 800-645-4301 or by filling out our online contact form. We are happy to assist with any questions or concerns you might have.